This comic book, published during the Korean War in the fall of 1952, contains a four-page story about Japan's kamikaze attacks in the last months of World War II. 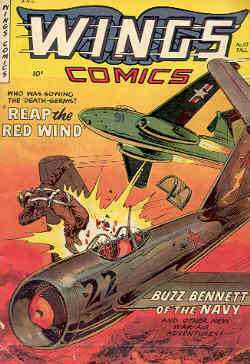 The comic book's other five stories all deal with Korean War battles, and even the story entitled "Kamikaze" starts with a dogfight over North Korea in 1952 and then flashes back to the last big air battle before the jet era. "Kamikaze," written by Lt. 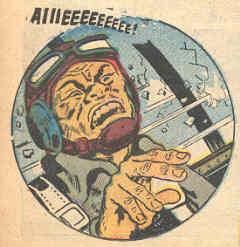 Commander Bill Watson of the U.S. Navy, has no real plot, and the comic describes the kamikaze attacks by the Japanese only in general terms. 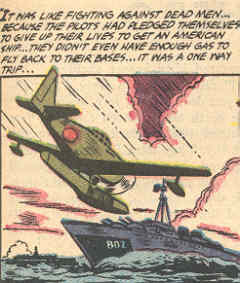 The last page shows a kamikaze plane hitting a destroyer with the number 802, which reflects true history even though the comic does not mention the ship's name. A kamikaze plane hit the destroyer USS Gregory (DD-802) on April 8, 1945, but the ship's gunners succeeded in downing two other kamikaze planes. The damage caused by the kamikaze crash into Gregory knocked the ship out for the rest of the war. The motivations of Japanese kamikaze pilots remain unknown in this story other than their desire to take as many Americans with them as they could. The author, who refers to the kamikazes as "flying dead men," presents an objective history of Japan's suicide attacks, but the details remain vague. A Japanese plane is shown about ready to hit the carrier Franklin, but in real history a plane dropped two bombs on the ship and did not crash into her. The final page explains that the kamikazes "chalked up a pretty good score," but the Americans shot down so many that the Japanese finally ran out of planes. The comic ends quite abruptly in the final frame with the dropping of the atomic bomb on Hiroshima.